Balthus is the pseudonym of Count Balthazar Klossowski de Rola (1908-2001). Born in Paris into a family of Polish descent, he came to the attention of the Austrian poet Rainer Maria Rilke when he was only 13 years old, and throughout his life he was to enjoy the friendship and admiration of some of the most discriminating creative minds of his day : Antonin Artaud, René Char, Giacometti, Fellini, Albert Camus, all of whom acknowledged the immense power of his work, his intelligence and personality. His career as a painter, too, was blessed by places of outstanding beauty : the wildest part of the Morvan region where he lived from 1954 to 1961 ; Italy which he had discovered when he was 17, and to which he returned as Director of the Villa Medici in Rome from 1961 until 1976 ; and finally the Alps, answering his need for solitude and grandeur. Today, at the height of his fame, he has chosen to spend the rest of his life in Switzerland, married to the painter Setsuko. Portraits, landscapes, city streets or interiors, Balthus’s work is classical in its measure and its subject matter, its mastery and its composition, echoing both the Italian Quattrocento, Courbet and Cézanne. But the sense of tradition is illuminated and transfigurated by an instinctive feeling for the secret life of people and of things, by a sorcery that fixes silhouettes on canvas in a single moment of eternity, by the bewildering sweetness of his pastel colours and by the cat-like sexuality of the female form, in which, as Verlaine put it “l’Indécis au Précis se joint” (“The indefinable and the precise are one”). 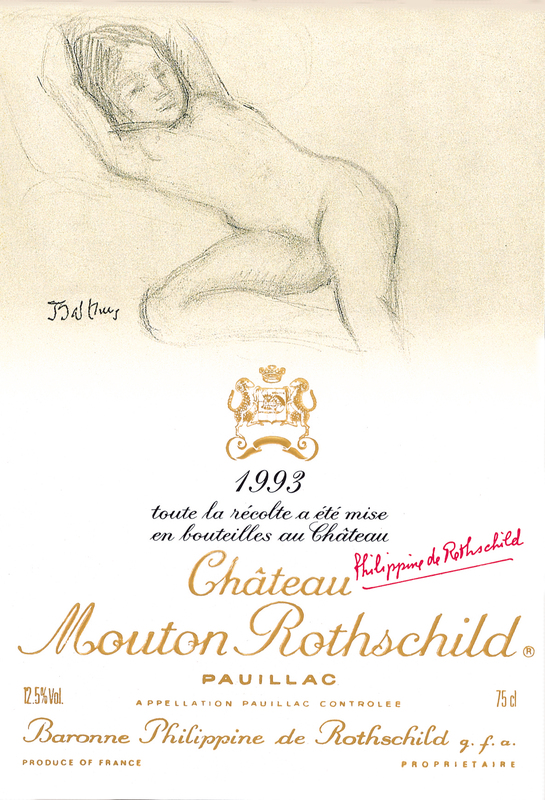 The drawing he made for Mouton Rothschild 1993 returns to a recurrent motive in this work : the dreamy adolescent girl, wilful, graceful and fragile… All the hypnotic power of a style that is both limpid and full of mystery, leading us away to distant lands of fantasy and desire.